An incredibly received presentation at the National Trainers’ Exchange in May 2017 led to, Art Taylor, JobTrain’s Chief Program Officer, being asked to do an encore by UCLA’s Labor Occupation Safety & Healthcare Program (LOSH). Art was asked to talk about JobTrain’s relationship in the construction trades, and some of the work JobTrain does, as a nonprofit organization. The presentation centers around the constraints ingrained in the State and Federal workforce policies under the First Source Hiring Program, enacted into law in 1998. Under this law, one of the requirements was that developers, contractors, and employers must utilize good faith efforts toward employing 30% of economically disadvantaged local residents in new entry-level positions on applicable project contracts over $350,000. The Good Faith effort would apply to residents with similar or trainable skills for the project during construction and after occupancy. However, on many occasions, there is a mismatch between the expertise in the community and the skillset required by many companies, especially in the Bay Area where a growing technology industry is dominating the employment marketplace. For example, when a developer contracted with Amazon’s Web Services (ASW) to lease 214,000 square feet office complex in East Palo Alto in 2017, Amazon was looking to occupy the building with approximately 1,500 employees, and nearly all of the position would require employees to have an engineering degree. There simply were not 30% or 350+ residents with an engineering degree in East Palo Alto. An alternative Workforce Strategy was developed between the developer, the city council and JobTrain to address this issue. 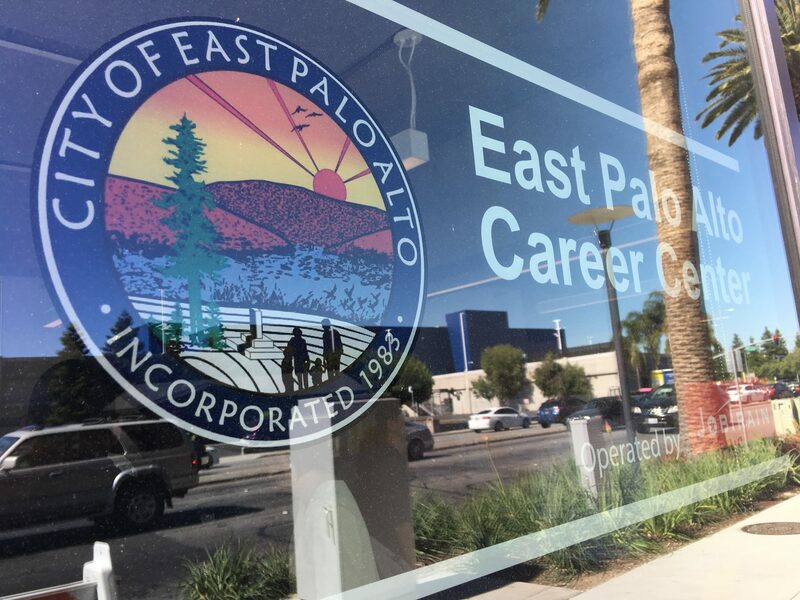 The creation of the East Palo Alto Career Center on the East Palo Alto Amazon Campus was gifted to the city/community for 10 years. This 1,500 square foot facility, operated by JobTrain, is complete with top quality technology and furnishings, and currently works with East Palo Alto residents/job seekers and assists them to execute their job search strategy in today’s job market while building their skills and the tools necessary to be a competitive candidate in their desired career pathway. The Career Center partners with a network of regional programs and organizations, so if the expertise required is not in-house, they will connect job seekers with one of their partner who does. Services offered at the Career Center includes: access to computers, fax machine job boards, recruiting events, industry specific information and training opportunities and referrals to other services needed. The Career Center also offers work readiness workshops, resume development and critique, interview strategies and practice, job search strategies, social media branding, veterans and older worker employment counseling and 1 on 1 career counseling. The Career Center leverage’s its existing local and regional business relationships, and employs strategies for engaging new businesses and industries. The Career Center takes a proactive approach in identifying business talent needs and matches the best candidate who meets the position requirements. The Career Center strives to be a trusted intermediary or broker who bring job seekers to business and business to job seekers and thus creates efficiency or operational continuity for both parties. Another example. Headquartered in Menlo Park, JobTrain partnered with Facebook to train 2 cohorts of Construction Training Programs. At the time, Facebook’s expansion plan to construct Building 21 and 22 was in development. Once these individuals finished the program, they had access to work in this construction project because they received specific training. The presentation was a success. JobTrain plans to host several of the Southern California non-profit organizations and union representatives who expressed interests in learning more about JobTrain, the East Palo Alto Career Center, and how they can utilize some of the strategies Art Taylor presented to help address workforce hiring requirement in their communities.